Airport guard: Hello, radio tower, Lisbon plane taking off in ten minutes, east runway. Thank you. Richard 'Rick' Blaine: Louis, have your man go with Mr. Lazlo and take care of his luggage. Captain Renault: Certainly, Rick, anything you say. Find Mr. Lazlo's luggage and put it on the plane. Airport guard: Yes, sir. This way please. Perhaps Woody's best effort in his 'neurotic schlep' persona. The script is a comic whirlwind, with too many brilliant scenes to enumerate (I can't resist mentioning the blind date's arrival - the desperate preparations and the pathetic introduction are funny but painful, in that we have all been in that position; his demonstration of authentic Chinese rice-eating technique is another classic). The device of the imaginary Bogart alter ego works well, especially in the climactic scene with Diane Keaton. 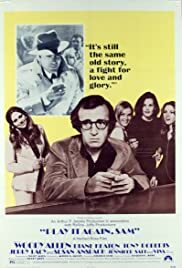 In my book this ranks with Sleeper, Manhattan, and Annie Hall as Woody's best films. 30 of 37 people found this review helpful. Was this review helpful to you?